Includes tie-down ropes and stakes. The 6 ft drop provides privacy and shade. A Sun Wave Awning Sun Shade is made of high strength polyester. Colored black with a 3/16 poly cord that installs easily into the same utility slot as your pull strap. Tie Down Ropes and Stakes are included. With an ample 6′ drop, you can add privacy to your patio area in addition to shade. The material also blocks any unwanted wind. Sun Wave Sun Shade can be used in car port position or standard position. 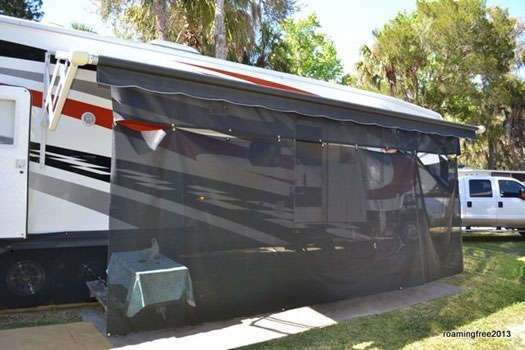 Order your Awning Sun Shade to match the length of your RV Awning. For best results use the center of arm to center of arm measurement to order the correct size. Please note that your Awning Sun Shade will actually measure 9-10″ shorter than the size stated (which is the awning fabric size).